In vehicles equipped with the push-button start function, the starting function may not be operational after recharging or while jump-starting a discharged battery. This condition is most likely to occur if battery voltage drops below 9 V. The following procedure has been developed to address this condition. (a) Confirm that the D/C CUT fuse is installed. If the D/C CUT fuse is not installed, install it at this time. (d) Open the driver's door. 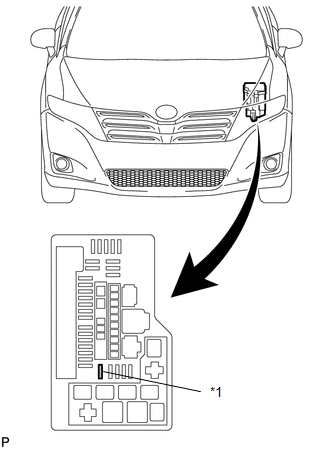 Opening the driver's door will start an initialization process between the steering lock ECU (steering lock actuator assembly) and the engine room junction block. (e) Depress the brake pedal. (f) Press the engine switch.